Errol: I realize that not a lot of people see this through the website. I mentioned on my twitter that NaNoToons Facebook had surpassed my geek band’s facebook, and I had a few people surprised that NaNoToons HAD a facebook! NaNoToons doesn’t have a twitter though. I figured that I would use my personal account for that because, well, I think only NaNoWriMo people follow me there anyway. I did find something cool called Tablo. I think it’s another self-publishing platform, however, there is a NaNoWriMo View! You can see mine. Look how pretty it is! In the bottom left, you can see stats! I like stats. It doesn’t have a way to jump chapters yet, which is good, because I don’t really want you people to read my pantsed novel. I assume length and reams of dialogue is enough to deter people. I will mention one important thing I added a while ago that is awesome, and that’s Comic-Rocket. It adds navigation to the NaNoToons. Did I mention that made me happy? It made me happy! This entry was posted in 2013 and tagged jen, rob. Bookmark the permalink. hah– nanowrimo would be easier if I didn’t have to do the whole novel thing. love it! Alas, my prediction of Rob surprising everyone by finishing halfway through the month is looking less likely. But I’m still rooting for him! I read through some of your novel, and it is exactly how I would expect cleric-you and fighter-Manda to be. Poor Lonpons…that doesn’t roll off the tongue as nicely as Manpans. 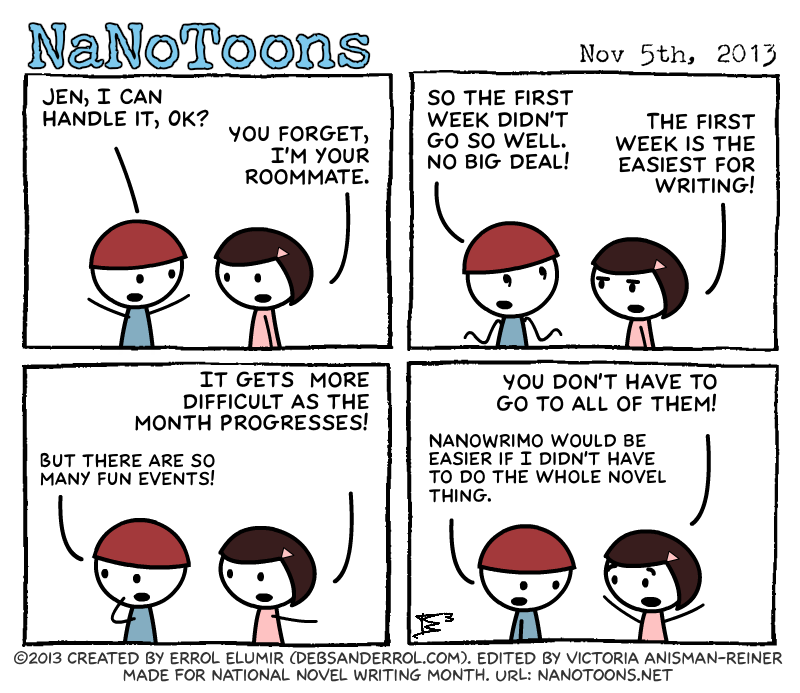 Technically if we didn’t have to do the whole “novel thing” there couldn’t be a NaNoWriMo. 🙂 I just love to write! *laugh* Huzzah! Thanks! Share away! It’s funny, I always find the first week the hardest for writing! I’m plagued with plot bunnies, and when I’ve only got a few thousand words, the temptation to abandon my novel and start over is too strong. I get most of my words in later in the month, once I’ve really got my teeth in my story.